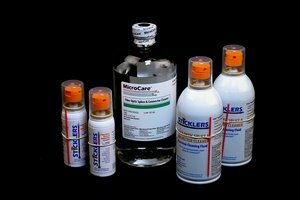 The Sticklers™ Fiber Optic Cleaning Fluid is a nonflammable liquid specifically engineered for fiber optic connectors. Ultra-pure, no residues, fast-drying and spill-proof, this fluid hugely out-performs alcohol. Enhances the cleaning results from any wipe, swab or cleaning tool. Unlimited shelf-life if properly stored; this product has no expiration date. Non-hazardous, nonflammable for easy shipping and storage: it even can be carried on commercial aircraft. Made in the USA. Globally GHS, RoHS and REACH compliant.